Live MoreLove MoreWrite More Happy 2014 everyone! So 2013 is almost over and, despite the numerous and some also flattering rejections, I am content with my poetic achievements this year. In the first place I wish to thank Kristy Bowen of Dancing Girl Pressfor accepting my chapbook Diagnosis for publication next year. Eratio Poetry Journal and Editor Gregory Vincent St Thomasino for Beckettesque, Norwegian Wood and Rodchenko in Dadaist ModePlath Profiles and Editor Bill Buckley for They Talk About Death, The Agony, Reading Plath in New MexicoEmpty Mirror and Editor Denise Enck for Ginsberg's Refrigerator& Après Nous, Le Chaos, WeberlandThirteen Myna Birds and Editor Juliet Cook for SalomeCease, Cows and Editor Heather L. Nelson forAfter Chagall, Baltic Dream with Dostoevsky I am also very thankful to Editor Heather L. Nelson for nominating my poemBaltic Dream with Dostoevsky for Best of the Net 2013. Dorothy Circus Gallery is one of my favorite places in Rome. I regularly pay visit to it to admire the amazing artists hosted there. No artist yet has left such a lasting impression in my soul as Clémentine de Chabaneix. Not even Nicoletta Ceccoli, whose work I truly love. 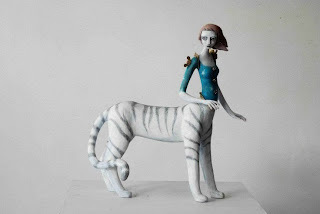 The sculptures of de Chabeneix's Silent Circus are inspiring me. I am writing new poems. I am posting some pictures here so that you may too fall prey to her beautiful creatures' charm. I have had a few very productive days and I am quite happy with the two latest poems I have written. I am always fascinated by how my imagination works. I often read something that touches me which becomes a trigger for words. It happened with two articles that I have read just a few days ago. The former focusses on a dream Roberto Bolaño had at the time he was imprisoned in 1973. A curious dream. In my poem the dream turns into an object. A real object belonging to Bolaño that lead me on an unexpected journey. 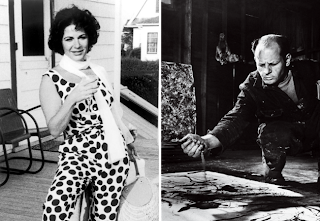 The latter deals with a disputed work by Jackson Pollock. The poem I wrote is a love ride that reminds me of one of J.G. Ballard's novels. I love it when poetry rules!